What We're Playing - December 2018! Winter Challenge! The idea behind these lists is to post what you're currently playing, or just played. It's interesting to see who's playing what, to see if people are playing the same things, and to ask questions that might otherwise be relegated to a forum about a game with the benefit of the responses coming from someone who has it fresh on their mind. 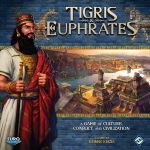 While there are several regular posters to this geeklist series, anyone is welcome to join in and post and discuss your games! Here's last month's list: What We're Playing November 2018 and Fall Challenge! THE WINTER AND HOLIDAY CHALLENGE!! This one will be a little different, and we'll do a crossover with the Advent Gaming Challenge 2018! Score for playing a winter or ice themed game! (Suggested by rainbowrose) Score for playing a game on a winter holiday (Christmas, Hanukkah, Kwanza, whatever you want!) or for playing a game you got as a gift this month! For a maximum of 5 stars! EDIT: Dropped the first star requirement from 4 games to 2; doing ALL the Advent challenges is a bit much for a second challenge. Played with the Carnies expansion. Very much not in the holiday spirit. My wife and I have had it for only a few weeks, and I did not think I would enjoy it as I do not much enjoy card games, but it is a fun little game. Admittedly it is not everyone's cup of tea, what with the dark humor. "Ah well, I suppose I shall murder the Viscount and bury him under the garden shed." Also played my first ever game of T&E last night and it lived up to all of my expectations. Again, not holiday related or anything, but I just wanted to add it because I feel good about it. 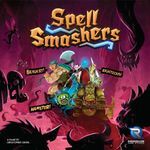 2 plays with new players, love the back and forth and the bluffing! The groans when someone dropped a bishop during a nasty battle...great stuff! 2 plays of this. The more i play it the more i like it! 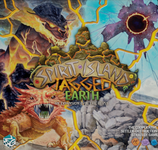 Wouldn't be a weekend for me without several games of Spirit Island. Recent arrival from KS. 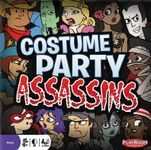 We've played several games of this over the weekend, with both the competitive and cooperative mode. We've enjoying both. I think I like the competitive mode just a tad better overall...but I really like co-op games. The co-op game has more of a "puzzle" feel to it (I need to do X, can I?) whereas the competitive mode has more of a "I can maybe do X or Y or Z, which one should I go for?" Played this while waiting for lunch at a restaurant (BBQ food, mac and cheese, delicious lemon pie...yummm). Wanted to play a bluffing game for the Advent challenge, and they said this counts. Lisa won every round. In one particularly dumb move, I swapped hands with her, giving a guard and getting me her king. I had no idea how I thought that was going to work. Last time we were playing our homebrew variant, we started to hit some balance problems in larger games. Re-did several things and had a very exciting back and forth game. Still several things I'm not completely happy with though. The advent challenge for Sunday was to play a pirate game. This is a great Feld. Very quick playing, a lot of luck but very fun. It was a close game; 87-85-85-78! One of those 85s would have been a lot higher if I hadn't gotten 5 scorpions over the course of the game! Saturday night I played a solitaire game called Aces Up - or the Devil's Solitaire. A quite nice solitaire game that I play from time to time. First time I got to play this, played with several family members using the family rules. We also played it later in the evening, but were trying to wrap up with so stuck with the family rules. I really want to play it again with the full rules, I think I am a big fan of this one! They didn't get to demo this for us at the Con, but Ash's mom ended up picking this up at the local game store! This game is crazy, but honestly it got a little old fast for me. Still a quick fun bit for some holiday theme. Ash's mom picked this up too. After reviewing the rules, I learned the game was demo'd just slightly wrong to us, but it was a minor scoring difference! Played two games of this on Saturday! I believe this should qualify for the bluffing game! Played a late game of this on Saturday. While I do enjoy this game, two games in I'm finding it starts to drag a bit for some reason, and I guess it is just the downtime of finding a word sometimes. Still a fan so far! A friend who is in town for a bit and joining us for lots of board games, really wanted to start a D&D campaign. I haven't been a fan of RPGs and was kind of over D&D after a long campaign of 3.5 in my school years. Ashley wanted to play though and we're going to give it a good shot. I did actually enjoy our short session on Sunday. I am playing a hill dwarf druid and Ashley is playing a half-elf ranger, in a custom world he has created. After our D&D session and dinner, we played and lost two rounds of this. One game we thought we had in the bag, but this version of pandemic can ramp up to a loss really really quickly. In one round we went from sure we'd win to totally out of control and loosing badly. Went to my Saturday meetup. My friend Ann and I were out of sink with everyone else so we mostly played games with each other. 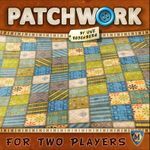 The first game we played was Patchwork. I had brought it because Ann likes lighter games and she asked to play it right away. 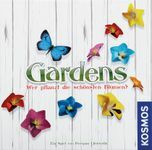 She had played Cottage Garden which is by the same designer and also has the polyominoes but had never played Pathwork. I won. I don't remember my score but her score was negative and she was very disappointed and discouraged. I offered to explain some basic strategy but she was uninterested. Don't know if we will play it again. Next, I asked to play Ann's copy of Lotus. It is such a beautiful game. I had seen it played before and wanted to try it out myself. 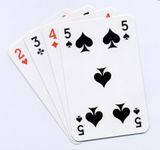 Some cards have 1 or 2 of a players icons. When a flower is finished, the player with the most icons wins 5 points or unlocks a power. 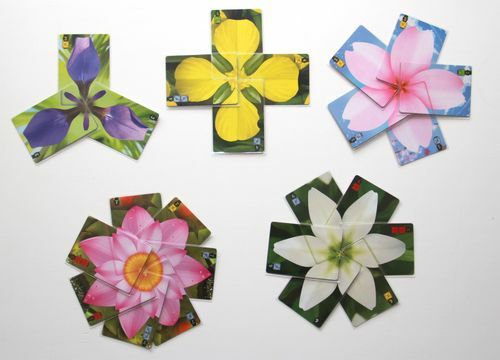 The person who finished the flower scores 1 point per card in the flower. That the basics. I haven't played much in the way of area majority before so it was something new. Ann won by 2 points. I might have to put this game on my wishlist. Chad might like it. So Satruday was the frist day of December and thus the first day of the Advent Challenge. The daily challenge was "Play a bluffing game". I was at my Saturday Meetup so you would think that someone would play such a game with me. But it seemed I had no takers. Ann didn't want to play my copy of Love Letter nor here copy of One Night Ultimate Werewolf which she had only brought for trading. Finally I roped a couple of guys who were waiting for a game to break up in order to start another one to play 1 round of Love Letter - Hundred Acre Wood Edition. Philip went frist and played Kanga & Roo (=Baron). He chose Christopher and they compared hands. Philip was out. I played Winnie-the-Pooh (=Guard) and guessed that Christopher had Christopher Robin (=Princess). I was right and I won the round and the game. One challenge down for the Advent Challenge. 1/4 of a star toward the Winter and Holiday Challenge. Ann had never seen or heard of this game but was attracted to the theme. We played 2-player and I won by 1 flower bed. It is often close and in fact often comes down to the tie breaker. We were still out of sink with everyone else. Ann had agreed to play Coal Baron but said it was too thinky for that late in the day. She did show me the game and explain how it played but we put it away and played BUS instead. BUS is a little pickup and deliver micro game that comes in a deck box the size of a pack of gum. Ann won 13 to 10. Finally we were in sink with some other players. Ann and I joined Water and Dustin. I liked it but I didn't like the card art and I don't know how good it would be with only 2. Most of my games need to play well with 2. So not sure I'll add this to my wishlist.